Matthew Gilsenan, James Nelson, Daryl Simpson. Telarc TEL-32982-02. Blame it on Carreras, Domingo, and Pavarotti. They started it all in the early Nineties as the Three Tenors, giving rise to all sorts of singing combinations like Three Mo' Tenors, the Three Canadian Tenors, the Three Chinese Tenors, the Three Countertenors, the Three Sopranos, the Three Cantors, the Three Amigos, the Three Horsemen of the Apocalypse. OK, I made up those last two, but you get the idea. 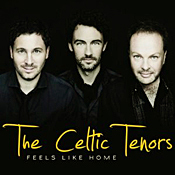 The Celtic Tenors--Matthew Gilsenan, James Nelson, and newest member Daryl Simpson--came along in 2000 as an extension of the Three Irish Tenors and have been going strong ever since. They sing mainly Irish, Scottish, Welsh, and English tunes on the present album, done up at times in a sort of operatic style. I reviewed one of their discs previously, Remember Me, a few years ago as I recall, and was singularly unimpressed. Not that the singing itself wasn't excellent, but most of the songs were too saccharine for my taste. This time out, it's more of the same, although I enjoyed them a little more. Maybe I'm just getting softer with age. The opening song, "Going Home," sets the tone for the album with a big, plush sound for a ballad written by American songwriter Mary Fahl. It's pleasantly nostalgic, although the accompaniment seems too elaborate for so simple a tune. With most of these numbers you've got drums, percussion, pipes, whistles, strings, guitar, bass, piano, the Omagh Community Youth Choir, and the Radio Teilifis Erin Concert Orchestra in the background, sometimes all going at once, and it rather overpowers, or at least takes away from, the singing. The next song, "Red-Haired Mary," is more traditional and folklike, which is why the heavy orchestration again seems out of place. Still, the tenors treat it so vibrantly, it comes across with a good deal of fun and excitement. "No Frontiers" and "Galileo" left me unmoved, despite their popular origins. "Silent Sunset" has the distinction of being a song by Yusef Islam, whom most of probably still know as Cat Stevens. Unfortunately, it is not one of his vintage compositions. Randy Newman wrote the title number, "Feels Like Home," and it's typical Newman--light, catchy, sentimental, melodic. As you have undoubtedly guessed by now, there is a lot of love, emotion, longing, caring, friendship, and the like involved in this collection. The Celtic Tenors are not folk singers per se, so don't expect the Clancy Brothers or Tommy Makem here. They're basically crossover pop singers, appealing to a diverse pop audience; they're just better singers than most such pop vocalists. The Tenors do "She Moved Through the Fair" a cappella, which I enjoyed most all. They are such fine singers, they really don't need all the background accompaniment distracting from the purity of their voices. Likewise, "The Wild Mountainside," a lovely ballad with minimal accompaniment, is quite affecting, as is the traditional Welsh lullaby "Suo Gan." Perhaps the group saved the best for last, "Westering Home." Except for again having an exceedingly thick orchestral and choral background, it's a song that genuinely touches the heart, and the Tenors give it a relaxed, joyful, heartfelt interpretation. The producers recorded the album at JAM Studios, Kells, County Meath, Ireland; Studio 1, RTE Radio Centre, Dublin, Ireland; and 1st Omagh Presbyterian Church, Omagh, Northern Ireland, in 2011, and Telarc Records, Concord Music Group, are distributing it. The sound is fairly close and loud, with little sense of space or air, just a kind of broad sonic field. It might work as pure commercial pop, but it conveys little sense of occasion or presence. Look, as I say, this is a pop album, aimed squarely at entertaining as many people of all ages and all musical persuasions as possible. As such, it will probably sell another million copies. For me, most of it was forgettable. But, then, I don't even own an iPad, so who am I to criticize other people's taste? 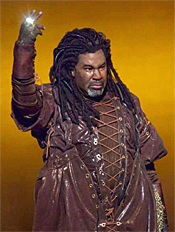 New York, NY – Eric Owens's work as Alberich in the Metropolitan Opera production of Das Rheingold last season was met with universal acclaim: The Philadelphia Inquirer lauded, "Owens alone is worth the ticket"; the New York Times noted his voice was filled with "stentorian vigor"; Manuela Hoelterhoff of Bloomberg cheered, "Eric Owens, now one of the greatest bass-baritones in the world, was sublime as crazy Alberich"; and Alex Ross of The New Yorker proclaimed, "Owens's portrayal is so richly layered that it may become part of the history of the work." It is not without a great deal of excitement, then, that audiences anticipate Owens's appearance in The Met's first full cycle of Robert Lepage's new production. Owens also embarks on a busy recital tour of his own this season, and appears in concert with the Cleveland Orchestra and the Boston and Atlanta symphony orchestras. The Metropolitan Opera's production of Siegfried opened on October 27 and will be performed on November 1 and November 5 (HD broadcast). Götterdämmerung will be performed on January 27, 31, February 3, 7, and 11. The first complete cycles of Der Ring des Nibelungen will take place in spring 2012. Owens will sing the role of Alberich in two complete cycles: Das Rheingold on April 7 and 26; Siegfried on April 21 and 30; and Götterdämmerung on April 24 and May 3. In addition to his on-stage duties, Owens will host his first Metropolitan Opera's HD broadcast, Philip Glass's Satyagraha on November 19 at 12:55 p.m. EST. This matinee performance will be transmitted worldwide as part of The Met: Live in HD series, which reaches 1600 movie theaters in 54 countries. Opera News understands that for many just seeing their favorite performers on stage and in print is not enough for audiences to connect with great artists. To give fans more access to the world of opera, the magazine hosts "The Singers' Studios: Candid and Casual Conversations." In this intimate interview series, opera singers chat with of Opera News editors and writers. Last season's series was held in front of a completely sold-out audience. On November 2 at 6 p.m., Eric Owens will sit down to talk with Adam Wasserman at the Opera Learning Center of the Metropolitan Opera Guild. Tickets are $25 and can be purchased here. Also this season, Owens embarks on a significant recital tour with pianists Robert Spano and Craig Rutenberg. With engagements in Washington, D.C., Berkeley, Portland and Philadelphia, Owens will notably perform February 21 at Carnegie Hall's Zankel Hall. He will sing Bach Cantatas with the Chamber Music Society of Lincoln Center on December 6. Owens will perform Beethoven's Missa solemnis with the Boston Symphony Orchestra in Boston and at Carnegie Hall, one of three appearances at the New York cultural institution in 2011-2012. Appearing as Jochanaan in Strauss' Salome with the Cleveland Orchestra, Owens assumes the role in both Cleveland and at Carnegie Hall in May. Summer 2012 begins with Owens reprising the role of The Storyteller in A Flowering Tree by John Adams with the Atlanta Symphony Orchestra. Owens will continue his summer at Glimmerglass Festival 2012 as the Artist-in-Residence. There, he will appear in Aida and Lost in the Stars, and will perform a cabaret evening. New York, NY - The Orion String Quartet, one of the most sought-after ensembles in the United States and Artist Members of Chamber Music Society of Lincoln Center, perform complimentary selections of quartets by Mozart and Haydn at Alice Tully Hall on November 4 at 7:30pm. After hearing young W.A. Mozart's six quartets dedicated to him, Franz Joseph Haydn said to Mozart's father, Leopold, "Before God and as an honest man, I tell you that your son is the greatest composer known to me." On March 30, 2012 the Quartet is joined by estimable clarinetist David Shifrin for quintets by Weber, Neikrug and Mozart at Alice Tully Hall. Over the past 24 seasons the Quartet has been consistently praised for the fresh perspective and individuality it brings to performances. With over fifty performances each year, the members of the Orion String Quartet - violinists Daniel Phillips and Todd Phillips (brothers who share the first violin chair equally), violist Steven Tenenbom and cellist Timothy Eddy - have worked closely with such legendary figures as Pablo Casals, Rudolf Serkin, Isaac Stern, Pinchas Zukerman, Peter Serkin, members of TASHI and the Beaux Arts Trio, as well as the Budapest, Végh, Galimir and Guarneri String Quartets. Haydn: Quartet in D minor, Op. 76, No. 2 "Fifths"
Mozart: Quartet in C Major, K. 465 "Dissonance"
Naxos Announces New Digital Products, Including iPad App of Best-Selling "My First Classical Music Book"
Naxos is proud to release several new digital products including an exciting new iPad application aimed at children aged five and above. Naxos has always been a market leader within the classical music industry and the launch of these new products cement Naxos' role as the leader in the classical, digital music field. On October 11, 2011, Naxos released its first App designed for the iPad. An interactive version of the hugely successful My First Classical Music Book, this app is the perfect introduction to classical music for children. Find out where classical music is used, meet the great composers, visit the sections of the orchestra and hear each instrument in action. The cost of this app is $2.99. For a video demonstration of the app, visit http://www.youtube.com/watch?v=BW9NCO3aGFI. North Bethesda, MD, October 25, 2011 – The National Philharmonic, under the direction of Music Director and Conductor Piotr Gajewski, presents Women Pioneers, a concert dedicated to women pioneers in law and music, on November 12 at 8 pm at the Music Center at Strathmore. The program includes as its centerpiece, Amy Beach's rarely performed masterpiece for chorale and orchestra, Grand Mass in E-flat Major, composed in the late-19th century when Beach was just 19. It pairs Joan Tower's Fanfare for the Uncommon Woman and the work that inspired it, Aaron Copland's Fanfare for the Common Man. The concert also includes a performance of Saint-Saens' Introduction and Rondo Capriccioso, Op. 28, featuring the world-renowned violinist Chee-Yun. The Honorable Madeleine Albright, the first woman to serve as U.S. Secretary of State, hosts this evening and opens the concert with a brief welcome, after being introduced by Maryland's former First Lady, Francis Hughes Glendening. All concert proceeds will go toward the Maryland Women's Bar Association Foundation's (MWBAF) scholarships and the Finding Justice Project, which documents the history of women lawyers in Maryland. Andrea Leahy, the managing partner of the law firm Leahy & DeSmet who coordinates the work of the Finding Justice Project of the MWBAF, explains that although much has changed, women's struggle to gain equality in the professions of law and music is far from over. "Less than one-third of American lawyers are women and their pay is only three fourths of that of their male colleagues," she says, citing figures from a New York Times editorial. "Women musicians face similar struggles," Leahy adds. "It's rare to see a woman at the podium of a major orchestra, and even rarer to find women composers' works featured on the program." Last summer, Leahy approached Maestro Gajewski to partner with the Finding Justice Project to produce a concert to showcase works by women composers and to help the Project raise funds to expand its law school scholarships. Gajewski (who is, coincidentally, a lawyer as well as a musician) embraced the idea and set to work to turn it into an exciting, innovative concert program. "For the National Philharmonic this is a great chance to introduce our audiences and our musicians to beautiful music by Amy Beach and Joan Tower that they rarely, if ever, have a chance to hear or perform anywhere else," Gajewski said. "At the same time, it enables us to support a great organization that is doing important work and to introduce the National Philharmonic to the audiences that support that work." At the heart of the program is Amy Beach's Grand Mass in E-flat Major, with the National Philharmonic Orchestra and Chorale. Ms. Beach, the first American woman composer of large-scale works, wrote the heartfelt and uplifting Grand Mass while still a teenager. The piece reflects the late Romantic period in its long melodies and breadth of conception. Aaron Copland's noble Fanfare for the Common Man, a piece commissioned during World War II to honor soldiers fighting in the ranks, as well as those working on the home front, is paired with Joan Tower's Fanfare for the Uncommon Woman (1986). The latter, written "to honor women who are adventurous and who take risks," uses Copland's Fanfare as its musical model. Violinist Chee-Yun, whose tone is like "butter, smooth, rich and flawless" (Strings Magazine), joins the Philharmonic for the dazzling Introduction and Rondo Capriccioso by Camille Saint-Saëns, one of the greatest child prodigies in the history of music. A free pre-concert lecture will be offered in the concert hall at 6:45 pm on November 12, 2011 at the Music Center at Strathmore. To purchase tickets to Women Pioneers on November 12, 2011 at 8pm at the Music Center at Strathmore, please visit nationalphilharmonic.org or call the Strathmore ticket office at (301) 581-5100. Tickets are $32-$79; kids 7-17 are FREE through the ALL KIDS, ALL FREE, ALL THE TIME program (sponsored by The Gazette). ALL KIDS tickets must be purchased in person or by phone. In addition, parking is free. From an initial field of 28 duos, seven advanced to the final round. In addition to the prize winners above, other finalists included 4HandsLA (Los Angeles, California, U.S.), Steven Vanhauwaert (Belgium) and Danny Holt (U.S.); Duo Fortin-Poirier (Montreal, Canada), Amélie Fortin and Marie-Christine Poirier (both Canada); and Susan and Sarah Wang Piano Duo (Rostock, Germany), Susan Wang and Sarah Wang (both U.S.). The competing piano duos ranged from 20 to 35 years old and came from around the world, including China, Japan, Indonesia, Korea, Taiwan, Russia, Germany, Canada, and throughout the U.S. Each duo performed 45–60- minute programs of at least three works, including a work by Mozart and a piano duo by Franz Liszt; more than half the competitors performed a work by Schubert to compete for the Pellegrini Prize. The three days of preliminary competition (expanded from the two originally planned due to demand and the caliber of competitors) took place October 20, 21, and 22, followed by the final round and prize presentation Sunday, October 23, all at Nichols Concert Hall, 1490 Chicago Avenue, Evanston. Portions from the final round will air on 98.7/WFMT, Chicago's classical radio station, at a later date. Also, String Trio in G major, K. 562e. Henning Kraggerud, violin; Lars Anders Tomter, viola; Christoph Richter, cello. Naxos 8.572258. My Random House Unabridged Dictionary defines a divertimento as "an instrumental composition in several movements, light and diverting in character, similar to a serenade. Also called a divertissement." My Harvard Concise Dictionary of Music goes on to say it "applied in the second half of the 18th century, especially in Austria, to an enormous variety of nonorchestral, instrumental works. These include lighter types, such as the cassation, serenade, and notturno, as well as more serious types of chamber music, such as the string quartet." Or, in the case of the String Trio in E flat major, K. 563, by Wolfgang Mozart (1756-1791), well, a trio. Interestingly, it was the only string trio Mozart would complete, writing it in 1788, the same year he finished his last three symphonies and only a few years before his death. So, it's one of the composer's very late and, thus, most mature works. Indeed, some critics consider the six-movement piece among his best compositions. Here, the Norwegian violinist Henning Kraggerud and Norwegian violist Lars Anders Tomter (both playing on period instruments) join German cellist Christoph Richter to produce a worthy addition to a small but growing list of fine recordings of the work. The three performers Naxos assembled on the disc play with distinction, as we might expect, and provide a pretty good rendition of Mozart's music, their tempos neither too fast nor too slow but about right for a traditional reading of the score. The Trio begins with an Allegro, played with spirit and bite. The performers take the principal theme, one of Mozart's typically beautiful melodies, at a pleasingly moderate gait that makes it melt in the air. Then, because they do not play the opening movement excessively fast, the lovely Adagio that follows is not so jarring a contrast as it might be but flows naturally from everything that went before. The players handle it lightly and poetically. After the Adagio we get the first of two minuets, a fairly energetic affair with a folklike character. In the center of things we find an Andante consisting of a series of variations, the players doing an adequate job distinguishing among them. Next, we're back to a minuet, only this time it is more stately and elegant, yet delightfully played, with appropriate grace and panache. The Rondo: Allegro that ends the work continues the cheerful temper of the previous segment, again flowing lyrically and heartily along. Kraggerud, Tomter, and Richter provide a charming reading of the piece all the way around, one that compares favorably to a couple of my own favorites in the work: Grumiaux, Janzer, and Szabo on a Philips Duo set and Kremer, Ma, and Kashkashian on a Sony disc. The "however" is that if you already own one or both of the older recordings, I wouldn't consider the newcomer any better, and, indeed, the older recordings may actually possess a degree more authority and conviction. Still, it's all a value judgment, and if you don't already own the music, any of the releases make respectable choices. 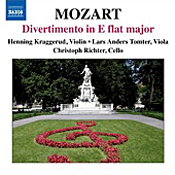 As a brief fill-up, Naxos also provide the String Trio in G major, K. 562e, a single-movement fragment that Mozart wrote shortly before K. 563 and maybe a stepping stone to the better piece. Why he never finished K. 562e is anybody's guess. Nevertheless, it exhibits in its few minutes duration the kind of musical moods to come, a Trio in miniature. One can hardly fault the sound. Recorded in Lindemannsalen, Musikkhogskole Oslo, Norway, in 2008, it's big and bold, or as big and bold as a recording of three performers can be. Miked at fairly close range, it spreads the three instruments across the sound stage and captures each of them vividly, yet without brightness or harshness. They sound quite natural, in fact, with just a touch of hall bloom to smooth out the response. In addition, we get a good dynamic response from the players, with more than adequate transient response. While there may not be quite the sense of intimacy from the performers at so close range, making them appear perhaps a little larger than if they were in a hall and we were listening to them, it's a trifling complaint in an otherwise fine recording. Domingo, Stemme, Fujimura, Bar, Pape, Bostridge, Holt, Rose, Villazon; Antonio Pappano, Chorus and Orchestra of the Royal Opera House, Covent Garden. EMI 7243 5 58006-2 (three CD's and one DVD). With its stellar leads, passionate direction, superb sound, elegant packaging, and extra DVD, this new set of Wagner's Tristan und Isolde goes to the head of the class in my grade book. Wagner's ultimate love triangle, based on the Arthurian legends of Tristan, Isolde, and King Mark, has never wanted for glorious recordings, the ones by Karajan (EMI), Solti (Decca), and Bohm (DG) springing quickly to mind. But, frankly, the competition tends to pale next to the sound and voices on this 2005 EMI release. The composer based his opera on the medieval accounts of the traditional story by German poet Gottfried von Strassburg. It recounts the tragic tale of two people who fall in love, the knight Tristan and the Irish Princess Isolde whom he must deliver to her husband-to-be, King Mark of Cornwall. The story has every bit of the romance, spiritual imagery, ardor, and fire one could imagine, and Wagner matched it with the grand, fervent, romantic spiritualism of his music. Domingo, Stemme, Pappano, and the Royal Opera House Chorus and Orchestra capture the Wagnerian spirit in all its transcendent glory. My first reaction upon seeing the cast list was that Placido Domingo seemed more than little old to be singing the part of the youthful Tristan. Yet upon hearing the set, I found Domingo's voice belied his sixty-odd years, coming through as strongly and as sweetly as it did twenty and thirty years earlier. My reaction upon seeing the name Nina Stemme was "Who's she?" OK, I'm not an avid opera buff, and I don't keep up with the latest artists in the field. Yet, upon hearing the Swedish soprano, I could understand her being chosen to sing next to Domingo. She not only holds her own, she equals his performance in every way, no small feat. This is singing of the highest caliber in all departments. Needless to say, the whole enterprise would have gone for naught if the sound weren't up to par, and it is. EMI's engineers have given us a recording of splendid depth and breadth. Voices are natural and fluid, the orchestra well spread out between the speakers, dynamics strong; and the frequency response wide. Although the stage effects are not as pronounced as those on Decca's old opera recordings of the Fifties, EMI's are nonetheless realistic. When a character sings from the topmast of a sailing ship, the voice sounds as though it's coming from the topmast. When singers are fretting about on stage, their voices move across the sound field. This is no mere concert recital. If I had to fault the audio in any way, however, it would be in the sound of the chorus, where the massed voices can on a few occasions seem overly bright, even fierce. I'm not sure if it was EMI's intent deliberately to brighten the chorus for added clarity or drama, or whether it was the accidental result of the miking, but in any case it's only a minor distraction in an otherwise flawless production. What's more, in addition to EMI presenting the opera on three CD's, they include a fourth disc in the set, a music-only DVD of the entire opera as well, recorded in DTS 5.1, Dolby Digital 5.1, and Dolby Digital 2.0 stereo, with a printed libretto that one can read on a TV screen, and subtitles in English, French, or German. To listen to the DVD, I left my main system, VMPS RM40s, and retired to my home theater, Boston Acoustics speakers, and a distinct diminishing of sonic quality; but it was interesting to note the increased musical ambiance afforded by the rear-channels. It didn't convince me it was an improvement, but it is different, and it's like icing on an already delicious cake. Jacques Loussier Trio. Telarc TEL-32270-02. The Jacques Loussier Trio, essentially a jazz ensemble, has been doing this kind of thing for a really long time, and Loussier himself for even longer. I've reviewed the Trio going back a decade and a half playing Bach, Beethoven, Chopin, Debussy, Handel, Mozart, Ravel, Satie, Vivaldi, you name it. Now, it's Schumann. Good choice. The idea behind much of the Trio's work is to take familiar classical pieces and reinterpret them through the prism of jazz, giving them new life, new personal meaning. 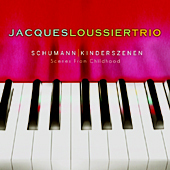 Loussier says of Kinderszenen, "This particular work by Schumann is ideal for reinterpretation in a jazz setting. Childhood is perhaps the most playful and carefree time of one's life. In the same sense, jazz is perhaps the most imaginative and carefree kind of music ever composed. It only makes sense, then, to reinterpret the compositions by Schumann that capture the most memorable and cherished moments of his youth." Loussier goes on to say, "When I prepare the music, I write down the principle part of the theme before the recording process begins, but it's not fully realized until we are in the studio and recording. I rearrange and change things, and I discover new things in the process." The current members of the Jacques Loussier Trio have been working in the jazz and classical fields for quite a number of years: Benoit Dunoyer de Segonzac, bass; Andre Arpino, drums; and Loussier, piano. Loussier himself has been exploring the classics and jazz since the 1950's, to give you an idea of extent of his experience. Anyway, here they play one of the most-celebrated works of German composer Robert Schumann (1810-1856), the thirteen-piece piano cycle Kinderszenen, "Scenes from Childhood," that he wrote in 1838 in memory of his own youth. These are mostly gentle readings, always true to the composer's intent, never inflated, never glamorized or revved up. Of course, they don't sound like your usual Schumann, either, which is the point. It's the best of both worlds, classical and jazz, scripted and improvisational coming head to head, with Schumann none the worse for wear. Among the selections, the opening piece, "Of Foreign Lands and Peoples," gets things underway in a lightly gratifying way. "An Important Event" has a keenly mysterious air about it. The centerpiece, however, is "Traumere" ("Dreaming"), the most-famous segment in the set. Loussier plays it longingly, lovingly, as the only solo on the album. While he perhaps tinkles extemporaneously with it a little too long, beginning to wear out its welcome, it still comes off with heartfelt emotion. The rambunctious "Knight of the Rocking Horse," with its showcase for percussion, makes for playful fun; and "Frightening" is, well, frightening. They're all imaginative reworkings and worth investigating. Recorded at Studio du Palais des Congres, Paris, France, and released by Telarc in 2011, the sound almost overshadows the performances, it's so good. As always, the three instruments appear fully defined, with plenty of air around each one. The performers are practically in the listening room with you. The piano is out front, figuratively and literally, offering a firmly realistic tone. The drums are solid, with a crisp transient impact, and the cymbals extend the response nicely. The engineers give the players a pleasantly resonant acoustic to work in, thus ensuring they don't produce a sterile sound but a perfectly natural one, if maybe just a tad too reverberant. 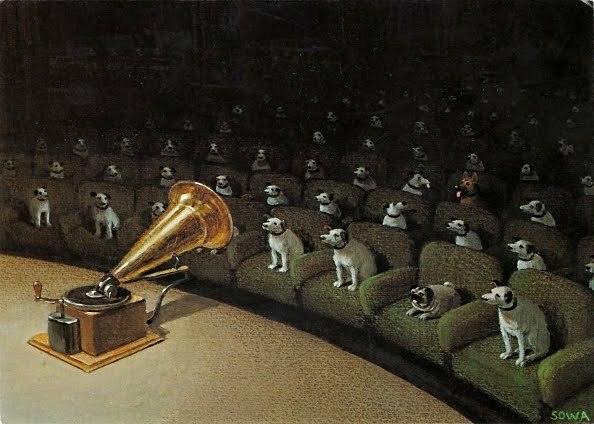 Wonderful listening, though. If I have any reservations at all, it's that Telarc provide only about forty-seven or so minutes of total playing time, about average, I suppose, for a pop album but not quite what one expects from even a crossover classical disc. Hilary Hahn Tours "In 27 Pieces: The Hilary Hahn Encores"
New York, NY--After two sold-out CD launch concerts at The Stone in New York City's lower east side on Monday night, and the release of Charles Ives: Four Sonatas, Hilary Hahn embarked on her U.S. recital tour in October. At the events--which served to both celebrate Charles Ives: Four Sonatas and to raise money for The Stone--Hahn played Ives's Sonatas 1 and 4, hosted a conversation with composer John Zorn and Ives biographer Jan Swafford, accompanied the crowd in hymn-singing, and led the audience in singing Happy Birthday to Charles Ives, who would have turned 137 on October 20. Charles Ives: Four Sonatas is available on iTunes and Amazon. 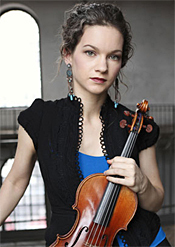 For more information on Ms. Hahn, her recordings, and the tour, visit http://hilaryhahn.com/. The Music Institute of Chicago presents the puppet theatre company Blair Thomas & Company in A Kite's Tale, Saturday, December 10 at 10 a.m. at Nichols Concert Hall, 1490 Chicago Avenue, Evanston. The 40-minute interactive performance, appropriate for ages four through twelve, combines theatre and puppetry and is set to Modest Mussorgsky's Pictures at an Exhibition, which will be performed by Music Institute faculty pianist Sung Hoon Mo. In A Kite's Tale, a little girl sets out to fly her kite and takes a magical journey through her own imagination. Every time her kite goes up, it crashes down, and her fear and anger transform her. When she calms down and returns to herself, she is able to see magic in the clouds overhead. But when playing with a balloon that suddenly pops, her anger returns. Trapped in an oversized world, she encounters two tricksters. Though they play with her, she's not sure if they are being mean or nice. Her fear blinds her, and she doesn't know what to do. When she feels most alone, a magical rabbit appears and offers simple tricks to help her overcome her fear and anger. With these gifts she is able to rescue herself from the storm clouds. The Music Institute welcomes families to Nichols Hall an hour before the performance at 9 a.m. for an instrument petting zoo, refreshments, early childhood demonstrations, student performances, and more. New York, NY - Robert Spano is known worldwide for the depth and intensity of his artistry, as well as his unique communicative abilities. This season he gives four New York performances; highlighting his distinguished abilities as a conductor, educator and pianist. This fall, he conducts the U.S. premiere of Esa-Pekka Salonen's Nyx in both Atlanta (Oct 27, 29) and at New York's Carnegie Hall (Nov 5). The November 5 performance marks Spano's sixth Carnegie Hall appearance with the Orchestra. He joins Orchestra of St. Luke's at Carnegie Hall (Dec 15) for a program of Messiaen and Bach, which includes Messiaen's Six Petites Liturgies de la Presence Divine and Bach's Magnificat featuring Atlanta Symphony Orchestra's Chamber Chorus. Respected as a collaborative pianist and composer, Spano joins bass-baritone Eric Owens in recital at Carnegie Hall's Zankel Hall (Feb 21). As an educator who finds inspiration through his work with young musicians, Maestro Spano will lead the Juilliard Symphony Orchestra at Alice Tully Hall (May 3) with a program of Vivier, Bartók and Sibelius. In ten seasons as music director of the Atlanta Symphony Orchestra he has enriched and expanded its repertoire and elevated the ensemble to international prominence and acclaim. 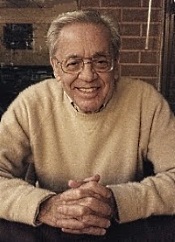 Mr. Spano conducts three world premieres in Atlanta during the 2011-2012 season; an ASO commission by Atlanta School of Composers member Adam Schoenberg and works by Alvin Singleton and Marcus Roberts. He also oversees two Theater of a Concert performances: Bach's St. Matthew Passion and John Adams' A Flowering Tree. In February 2011, the Atlanta Symphony Orchestra partnered with Naxos to create the ASO Media label. The unanimously praised premiere recording introduced new works by Atlanta School of Composers members Jennifer Higdon and Michael Gandolfi conducted by Robert Spano. June 2011's release featured Mr. Spano leading the Orchestra in Atlanta School of Composers member Christopher Theofanidis's Symphony No. 1 and the late Peter Lieberson's Neruda Songs with mezzo-soprano Kelley O'Connor. This fall, the Orchestra and Spano released its third recording for ASO Media featuring Rachmaninov's Symphonic Dances and Piano Concerto No. 3 with Garrick Ohlsson. Spring 2011 marks the third, and final, year of Spano's three-year residency at Emory University, a testament to Spano's communicative abilities and passion for education. In its 165-year history, Emory University has honored only seven other individuals with such expansive residencies, including the Dalai Lama, President Jimmy Carter and author Salman Rushdie. In September 2011, Robert Spano became Music Director of the Aspen Music Festival and School and was named a Fellow of the prestigious Aspen Institute as part of the Harman-Eisner Artist in Residence Program. Also, Triple Concerto. Michael Roll, piano; Jean-Jacques Kantorow, violin; Raphael Wallfisch, cello. Howard Shelley, Royal Philharmonic Orchestra. Royal Philharmonic Masterworks Audiophile Collection RPM 28700. Of the several Royal Philharmonic re-releases I've heard from the Allegro Corporation, this one with pianist Michael Roll and conductor Howard Shelley seems to me the best of all. 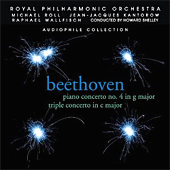 It offers some of the most well-rounded interpretations of Beethoven I've heard, some splendid sound, and a coupling, the Fourth Piano Concerto with the Triple Concerto, I've not found elsewhere. It makes a good package. The album begins with the Piano Concerto No. 4 in G Major, Op. 58, which Beethoven wrote in 1805-06, around the same time he wrote the Fourth Symphony and parts of the Fifth Symphony. The tempos the performers choose are neither lax nor rushed but just right in a traditional sort of way. Expect no surprises here, no period-instruments practices, just good, old-fashioned music making. Pianist Roll, too, is on his game, combining a virtuosic style with a light, lyrical touch, making this Fourth Concerto a sweetly gentle affair, despite the more-rambunctious parts. With Roll and Shelley the first movement perhaps misses a little something in terms of ultimate dramatic effect, making up for it with a balmy, mysterious air. Frankly, I find the length of the first movement difficult for any soloist to sustain; nevertheless, Roll holds his own throughout. The slow movement Andante, scored for piano and strings only, comes off even better, with not even a minor reservation from me. Roll's remarkably poetic manner makes the perfect foil for Beethoven's slightly agitated orchestral accompaniment. Then, we get the big finale--passionate, tempestuous, rhythmic, stormy, graceful, you name it, Beethoven goes for broke, and Roll and Shelly keep up nicely. Along with the Fourth Concerto we get the Triple Concerto in C Major, Op. 56, dating from around 1804, making an obvious historical connection with the Fourth. Attended by such distinguished artists as violinist Jean-Jacques Kantorow and cellist Raphael Wallfisch, the RPO, Roll, and Shelley make a formidable team. Their reading of the Triple Concerto is refined and exciting, beautiful and energetic. Combining power, charm, and authority, it's an ideal companion piece on the disc. Because Royal Philharmonic Masterworks and the Allegro Corporation, who have re-released this disc, seem reluctant to disclose any recording dates on their packaging, I had to do some Googling to discover that Tring originally issued the disc in 1997 as a part of their "Royal Philharmonic Collection." What the new release does tell us, however, is that it is a "20 bit digital recording, edited and mastered via 32 bit digital sound processing, recorded in high definition and playable on all CD players." Anyway, the sound is weighty and warm. It's also moderately close-up, yet not so close that we don't hear at least a modicum of stage depth. Although the piano seems a little too forward in the Fourth Concerto for my liking, it produces a reasonably clear, clean tone. In addition, the dynamic impact could be stronger and the midrange a touch more transparent; however, on the whole the sonics are natural and realistic and highly listenable. While I like almost everything about this release, I can't say I'm too fond of the cover art. Like their other RPM booklet covers, this one is in black, making the titles hard to read. What's more, it features four white blotches that appear either to be a fireworks display or bullet holes in a windshield. I much prefer cover art I can easily read as well as look at and enjoy. Mikhail Pletnev, Russian National Orchestra. Ondine ODE 1180-2D (2-disc set). Perhaps it's just me, but it seems as though every other disc I review anymore features Mikhail Pletnev and his Russian National Orchestra performing some Russian work or another. He pops up on DG recordings, on Virgin Classics, PentaTone, Philips, Newton Classics, and now on Ondine. The guy's everywhere. Either a lot of people like him, or he works cheap. As I'm sure you know, Peter Tchaikovsky (1840-1893) adapted his two-act ballet The Nutcracker from E.T.A. Hoffman's story "The Nutcracker and the Mouse King" and premiered it in 1892. He didn't like it, though. Indeed, friends said he hated it, especially compared to his previous ballet, The Sleeping Beauty. It's ironic, then, that in our own time The Nutcracker has become possibly Tchaikovsky's most-popular, nay most-beloved, work and maybe the most-popular ballet of any kind ever written. Certainly, it's got a little something in it to make everybody happy. So, is there anything about this new recording from Pletnev that should make us forget some of the best recordings of the past, like those from Antal Dorati and the Concertgebouw Orchestra (Philips), Dorati and the LSO (Mercury), Andre Previn and the LSO (EMI), Vladimir Ashkenazy and Royal Philharmonic (Decca), Charles Dutoit the Montreal Symphony (Decca), Simon Rattle and the Berlin Philharmonic (EMI), Valery Gergiev and the Kirov Orchestra (Philips), or Charles Mackerras and the LSO (Telarc)? Well, not really. Things start out well enough with a vigorous yet unhurried Overture, followed by Pletnev's fairly tranquil handling of the Christmas ornaments scene. However, as he will do throughout the reading, he seems to favor either very quick or very slow tempos, without a lot of gradation in between; it achieves an outward appearance of excitement but ultimately seems a little artificial. The familiar march that comes next also adheres to this quick-slow pattern, Pletnev beginning it in a relaxed, stately fashion, and then hurrying the middle section so much it appears as though everyone is in a race. After that, he settles into a relatively rigid, static pace. And so it goes. Certainly, the orchestra play as precisely as ever and observe Pletnev's every direction to the letter, yet they often sound slightly thin, too, lacking a degree of lower-midrange weight. Anyway, I didn't find as much beauty, mystery, drama, passion, or sheer magic in Pletnev's interpretation as I did with any of the conductors cited above. Pletnev seems content to play the notes and mind the score, only launching himself into the music on occasion, and then, as I say, doing so somewhat frenetically. The first act ends with the "Waltz of the Snowflakes," which Pletnev handles rather perfunctorily, devoid of much of the grace and lilt it demands. Like most of the rest of his rendition, it lacks much energy or imagination. Perhaps it just lacks much love, I don't know. Tchaikovsky saved his best and most-memorable material for Act Two, which occupies the second disc. Here, the composer tends to forget about the story for a while and just entertain us with a series of delightful melodies. Because of the nature of the music, Pletnev can hardly lose. So things do pick up in the second half, although one might still find greater delight in Dorati or Previn, my favorites. By comparison, Pletnev often seems either to drag or push too hard. 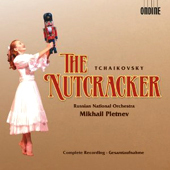 Ondine recorded The Nutcracker at Mosfilm Recording Studios, Moscow, in March of 2011, and the results make for one of the better-sounding recordings of the Russian National Orchestra I've heard. The strings are clear and generally smooth, with only occasional moments of bright edginess. The midrange shows good clarity, maybe aided by the moderately close-up miking. There is not much stage depth involved, though, the orchestra sounding rather flat most of the time. No matter; making up for it are a crisp transient impact, especially noticeable on plucked strings and percussion, and a wide dynamic range with a pleasantly extended treble and bass response. While I suppose purists will always insist upon having the complete ballet, and I don't blame them, I can't help thinking that The Nutcracker would also work well on disc in a slightly truncated version. The ballet often lasts about 90-100 minutes, yet edited to 75 minutes of the best tunes, it would fit neatly onto a single CD without sacrificing much. Maybe somebody will give it a thought someday. It certainly would have benefited Pletnev. Finally, the two Ondine discs provide only 93 minutes of music, when there is a total capacity for close to an hour more content. It would have been nice to have gotten a coupling, no matter how brief, from Ondine. Tintagel; The Garden of Fand; The Happy Forest; The Tale the Pine-Trees Knew; November Woods. David Lloyd-Jones, Royal Scottish National Orchestra. Naxos 8.557599. 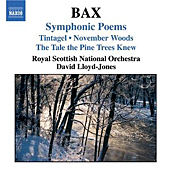 Conductor David Lloyd-Jones and the Royal Scottish National Orchestra recorded English composer Arnold Bax's complete symphony cycle for Naxos between 1995 and 2003, with each symphony accompanied by one of the composer's tone poems per disc. A little later, the enterprising Naxos folks did a welcome double dipping by releasing five of the tone poems on their own CD, reviewed here. Lloyd-Jones does well by these symphonic sketches, although none of them match my favorites, recorded by Sir Adrian Boult for the Lyrita label back in 1968. Still, Lloyd-Jones has the measure of the music. The disc begins with Tintagel, Bax's depiction of the rocky precipice on the Cornish coast reputed to be the birthplace of the legendary King Arthur. Like the actual location, the short, symphonic tone picture is all about rugged seascapes, craggy cliffs, and splashes of ocean spray. David Lloyd-Jones serves the music well, although his interpretation is a tad on the light, leisurely side compared to the more rough-and-tumble vigor displayed in the work of conductors Bryden Thomson (Chandos) and the aforementioned Boult. Bax based The Garden of Fand on Irish legend, the music describing a picture of a calm sea over which sails a small ship, eventually tossed onto Fand's island, where the gods play with the lives of mortals. I thought it came off the best of all Lloyd-Jones's readings, where he expresses the strong but quiet emotions of the tale vividly and strikingly. Following this, we find The Happy Forest, a short piece adhering to Bax's pastoral pattern. Bax described it as a nature poem, and, in fact, basing it loosely on a poem; but it is mainly impressionistic, not programmatic, and Lloyd-Jones sensibly maintains a tight rein on any possible histrionics. The next-to-last poem is a sixteen-minute composition with the inconvenient title The Tale the Pine-Trees Knew. I say "inconvenient" because it tends to make the piece seem like a children's story, which it most pointedly is not. Bax fills it with strong rhythms, rugged harmonies, and moody reflections, all done up sympathetically by Lloyd-Jones, whose Scottish forces must have this music in their blood. And the final work is November Woods, one of the best things Bax ever wrote (along with Tintagel). November Woods is evocative of a Buckinghamshire wood on a proverbial dark and stormy night. Although again Boult portrays the scene more picturesquely, Lloyd-Jones is almost equally atmospheric. Oddly, I thought the Naxos sound was best in the earlier recordings, the 1995-96 productions of November Woods and The Tale the Pine-Trees Knew. By the time Lloyd-Jones recorded Tintagel in 2002, the sound appears to have become softer in the midrange and more billowy in the mid-bass. Nevertheless, given the fact that Boult's collection on Lyrita is sometimes hard to find (it seems to keep appearing and disappearing in the catalogue), and that Naxos price the disc absurdly low, I can't think of a reason in the world why the interested listener shouldn't try it. Also, Miaskovsky: Quartet No. 13. Pacifica Quartet. Cedille Records CDR 90000 127 (2-disc set). The Soviet-Russian composer Dmitri Shostakovich (1906-1975) was a man of many moods; or least his music reflects many moods. I'm sure a lot of people, like me, tend to think first of his heavier, more-severe works, his fifteen symphonies of various degrees of complexity and angst, yet he could also produce colorful ballets or the delightfully rousing Festive Overture. In and out of favor with the Soviet government for not being conservative enough, Shostakovich always seemed to emerge on top by proving his traditional credentials while at the same time writing music that fit into modern trends. Love him or hate him, he created a ton of material, at least some which appeals to practically everybody. 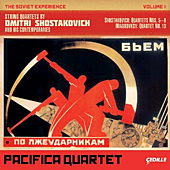 The current two-disc set from Cedille Records, subtitled The Soviet Experience, Volume 1, presents four string quartets by Shostakovich and one by a contemporary, Nikolai Miaskovsky, that reflect some of the differing tempers of music in the Soviet Union, as interpreted by the Pacifica Quartet. The String Quartet No. 5 in B-flat major, Op. 92, written in 1952, is the fifth of fifteen string quartets the composer wrote. In three movements--fast, slow, fast--played without a break, the music demonstrates a point Professor William Hussey makes in his booklet notes (which are worth reading, by the way): "The informal nature of the string quartet allowed for private performances. So the quartet form became a useful outlet to the composer when the political climate was not conducive to public appraisal of his music." In other words, he could get away with more in the intimate, relatively private quartet than he could in big, public symphonic presentations where the Soviet censors would likely be lurking. At the time Shostakovich wrote the Fifth Quartet, the Soviet government had already condemned his music as deviating from Socialist Realist tenets. With the Fifth, the composer continued to defy convention by including a number of conflicting motives and rhythms. The String Quartet No. 6 in G major, Op. 101 from 1956 sounds remarkably more conventional, more lyrically Romantic, even classical, than No. 5. This seems odd because by this time Stalin had died, and there was a new cultural freedom in the Soviet Union. So why return to the past? Perhaps a new marriage had a calming effect on the composer. Or perhaps the music isn't as traditional as it appears. In any case, the Pacifica Quartet (Simin Ganatra, violin; Sibbi Bernhardsson, violin; Masumi Per Rostad, viola; Brandon Vamos, cello) play Shostakovich as though born to it. Among the best small ensembles in the country, the Pacifica players perform with enthusiasm, passion, grace, precision, and, above all, virtuosity. If anyone could make Shostakovich come alive for twenty-first century ears, it's these folks. The second disc contains two more Shostakovich quartets, Nos. 7 and 8, both from 1960, and the String Quartet No. 13 in A minor, Op. 86, by Nikolai Miaskovsky (1881-1950). Of the three, No. 8 is probably the most recognizable, the most personal, and the most tragic. The Pacifica players give it an ardent, heartfelt interpretation. The Miaskovsky quartet reminds us that he was born and raised before the Russian Revolution and still adhered to much of the old school. Yet he had much to learn from the younger generation as well, and the music is at once melancholy, energetic, serene, and agitated. Again, the Pacifica Quartet seem more than happy to exploit these varying climates. One of the usual pleasures of a Cedille recording is listening to the work of audio engineer Bill Maylone, who with co-engineer Judith Sherman, turns in another splendid job with the Shostakovich. Recorded in the Foelinger Great Hall, Krannert Center, University of Illinois at Champaign-Urbana in 2010 and 2011, the sonics are exceptionally smooth and natural. There is a clear separation of instruments without pinning each to the wall for minute examination. Although it's miked a tad close, making the group appear bigger and more widely spread out than they would probably sound in person, the effect is fairly effective in terms of midrange transparency, with a touch of hall ambience for added realism. Finally, I would note the cover picture (see insert above), which Cedille point out they meant ironically, "as a (literally) striking representation of 'The Soviet Experience' for composers such as Shostakovich and Miaskovsky, especially at the time of their 5th and 13th Quartets, respectively, coming in the aftermath of the notorious Zhdanov decree of 1948." I like it. Piano virtuoso Jeremy Denk, baritone William Sharp featured in multi-disciplinary exploration of iconic composer Charles Ives. 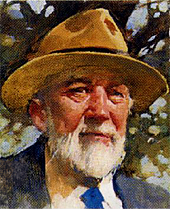 North Bethesda, MD - Who is Charles Ives? An irrefutably transformative force in American music and innovative composer, Ives had little public exposure during his career and remains relatively obscure to the concert-going public. As an encore to its ambitious Stravinsky Project in 2010, Strathmore, in partnership with Post-Classical Ensemble, will embark on The Ives Project, a cross-disciplinary three-day exploration of the work, life, influences and impact of the iconic New Englander Charles Ives. From Thursday, November 3 through Saturday, November 5, 2011, this immersive experience will convene actors, scholars and musicians, including two of the most eminent exponents of Ives' music--the pianist Jeremy Denk and baritone William Sharp—to tell the story of Ives through live performances, rare recordings, readings from his private diary and letters and expert lectures. For additional information, call (301) 581-5100 or visit www.strathmore.org. "Ives Masterclass with Jeremy Denk"
"Charles Ives: A Life in Music"
As the Israel Philharmonic Orchestra prepares to open its 2011-2012 season on October 13, the classical music world recognized the contributions of IPO's "Conductor for Life" Zubin Mehta with two significant honors. In September Maestro Mehta received the Furtwängler Prize "for his commitment to music and social problems" and he accepted the Lifetime Acheivement Award at Germany's ECHO Klassik Awards on October 2nd. 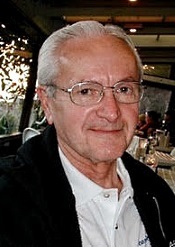 Mehta commented "(The Furtwängler Prize) is a huge honor. I don't think it's necessary to give me a special award, however. I am a musician, I make music with my favorite orchestra, and that's enough for me. Each concert is an award and a gift to me." This season celebrates the 75th anniversary of the IPO's founding, sees the renovation of Mann Auditorium, the Orchestra's permanent home, and features an exciting 75th Anniversary Festival in December. Select U.S. concerts in October in support of Mediterráneo, out now on Deutsche Grammophon. The guitarist released his Deutsche Grammophon debut, Mediterráneo, in June, followed by chart success and critical praise in the U.S. and UK. Also, Seven Irish Tunes; Dramatic Overture: The Moor of Venice. David Lloyd-Jones, Royal Liverpool Philharmonic Orchestra. Naxos 8.570145. To understand the nature of the music on this disc, it helps to know that British composer, conductor, and music teacher William Alwyn (1905-1985) spent most of his career writing film music. You may have heard some of it without even realizing it in movies like Odd Man Out, The History of Mr. Polly, The Winslow Boy, The Rocking Horse Winner, The Crimson Pirate, Malta Story, Wee Geordie, A Night to Remember, The Professionals, Swiss Family Robinson, and In Search of the Castaways. I mention this because Alwyn's cinematic style tends to seep over into his orchestral concert work, with everything seeming to come out in bits and pieces, nothing lasting too long, as though he were scoring a movie with thematic musical cues. It's not a bad approach, just different. The program opens with the dramatic overture The Moor of Venice, written in 1956, a musical treatment of Shakespeare's Othello. Dramatic it is, with David Lloyd-Jones and the Royal Liverpool Philharmonic going for the tragedy above all. I have to admit I didn't find it particularly engrossing, but it is certainly boisterous; and it's one of three works on the disc that finds a world-première recording. Then, we get the Concerto Grosso No. 2 from 1948. Alwyn scored it for string orchestra, so it sounds a bit smaller and airier than the other works on the disc. It's a vigorous, active piece, with much high energy and good spirits to recommend it. In three movements, it starts with a delightful Allegro of contrasting moods, reminiscent of Bernard Herrmann's music; followed by a tranquil Adagio with a particularly lilting, pastoral melody at its core; and concluding with a spirited finale in which Lloyd-Jones appears to find great delight. Next, we get another world-première recording, this one of the short, four-movement Serenade from 1932. It starts out quietly but soon develops a series of differing tempers, from a Bacchanal to an Air, finishing up with a kind of Highland march. Although I can't say there's a lot of continuity among the various sections, they are fun, at least as Lloyd-Jones and company offer them up. Seven very brief Irish Tunes come next, a suite for small orchestra that Alwyn wrote around 1936. They are happy little ditties, of minor consequence yet pleasant-enough to hear. They sound as though they should accompany a film set in Ireland, something like The Quiet Man. Again, it's a world-première recording. The program ends with the Concerto Grosso No. 3 from 1964. It's more serious than No. 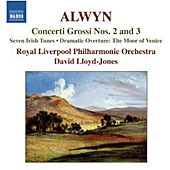 2, Alwyn writing it as a commission to celebrate the twentieth anniversary of the death of conductor Sir Henry Wood, which may explain some of the work's gravity. While Lloyd-Jones does his best to bring the music to life, the whole thing is so dark and solemn, it's a hard sell. Recorded at Liverpool Philharmonic Hall in 2007 and 2010, the sound is quite attractive, very open and clear. The recording provides a modest orchestral depth and wide stereo spread, the strings exceptionally smooth without ever being soft or recessed. The dynamic range is merely adequate, not too terribly wide, as are the bass and treble extension. Nevertheless, this is music that doesn't generally require much in the way dynamics and bass, so it probably doesn't matter as much as the transparency of the midrange, which is what stands out here. 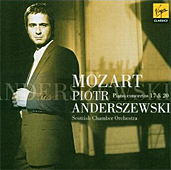 Piotr Anderszewski, piano and direction; Scottish Chamber Orchestra. Virgin Classics 0946 344696 2. I had never heard anything from pianist Piotr Anderszewski before Virgin's release of this disc several years back, but the man is certainly a force to be reckoned with. He's been making acclaimed piano recordings for the past fourteen or fifteen years, and this was, I believe, his second recording of Mozart pieces. I doubt that anyone will find him entirely disappointing, although his playing is not without its eccentricities. While the pianist (who also acts as director of the Scottish Chamber Orchestra) appears to play with complete precision and forethought, the melodies seeming to come out in a semi-improvisatory way. The performances sound perfectly well ordered, yet there is nothing cold or calculating about them. Indeed, they have a precision and purpose that are hard to deny. Yet, for my taste, I found the readings a tad rushed in the outer movements as well as in the great Romance of Piano Concerto No. 20. Perhaps that is a simple matter of personal taste, so one can easily discount it. What is clearer is that Anderszewski performs both concertos with power and grace, and the interpretations provide plenty of gusto along with the poetry. So, take your choice. What may also be a matter of taste, though, is Virgin's sound, which is somewhat soft, warm, and slightly shrouded in hall resonance. Maybe to some ears the acoustic will seem to flatter the music, but I found it a bit too vague for the exactitude of the piano playing. It's an odd circumstance, this. The soft-focus sonics would seem to complement the dreaminess of Mozart's slow movements, yet it only made me wish for greater clarity. Also, The Lament for Beowulf. Gerard Schwarz, Seattle Symphony and Chorale. Naxos 8.559700. Even if you can't place the name Howard Hanson, you might have heard music from his Second Symphony in the movie Alien, or you might have heard him conducting any number of recordings for Mercury dating from the Fifties and Sixties. Hanson (1896-1981) was an American conductor, teacher, musicologist, and Pulitzer Prize-winning composer who gave us any number of good compositions as well as quite a few fine audiophile recordings. On the present disc, we hear his Symphony No. 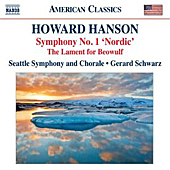 1 "Nordic" and his work for orchestra and chorus The Lament for Beowulf, both conducted by Maestro Gerard Schwarz and his Seattle Symphony and Chorale in 1988 and 1990 for the Delos label and re-released by Naxos in 2011. Alongside Hanson's own recordings of these pieces for Mercury, Schwarz's recordings of Hanson's music make a formidable alternative. The disc begins with the relatively short, three-movement Symphony No. 1, "Nordic," from 1922. Hanson was of Swedish descent and had a great affection for Scandinavian music. He patterned his First Symphony after Jean Sibelius's Symphony No. 1, so you'll hear some of the same dark, vast, brooding northern landscapes pictured in both works. In comparison to Hanson's own recording of the piece, Schwarz's rendition is marginally broader, which some listeners may prefer for its greater drama and others may not, finding it simply slower. Hanson described the first movement as singing "of the solemnity, austerity and grandeur of the North, of its restless surging and strife, of its somberness and melancholy." Under Schwarz, it sounds more leisurely than under Hanson, more lyrical and flowing. It seems warm and comforting on the one hand yet deeply agitated, almost threatening on the other, all the while evoking a lonely, distant, and, yes, Romantic, mood. The second movement Andante is more gentle, rhapsodic, and serene than the first movement, although it never falls into the sentimental category. Schwarz establishes and maintains a mood of calm that slightly surpasses that of Hanson himself. It's especially tranquil in its suggestion of seagulls in flight. Finally, the third-movement Allegro con fuoco tackles themes that are more folklike yet more ardent and assertive, more tempestuous, more stormy than anything in the preceding two segments. Here, Hanson the conductor has the upper hand, producing a somewhat more energetic closing statement. Still, Schwarz involves the listener sufficiently in the composer's colorful melodies and whirling rhythms. Even though Schwarz may not close the show as emphatically as Hanson does, he ensures a satisfying conclusion, nonetheless. The Lament for Beowulf, 1925, is music in a similar vein as the First Symphony in that it is ominous and somber. However, this time Hanson sets the music to orchestra and chorus. Of course, the composer based it on the early eighth-century English poem (set in Scandinavia) that recounts the daring feats of the hero Beowulf. Upon his death, the people express their sorrow at his funeral. The women mourn, and Beowulf's wife and handmaidens voice their anguish beside the hero's funeral pyre by the sea. Schwarz's interpretation, again slower than Hanson's own, is aptly elegiac, solemn, harsh, grave, and grim, while still being epic in scope. Delos recorded the music at Seattle Opera House, Seattle, Washington, the Symphony in 1988 and the Lament in 1990. The sound is smooth and wide--wide in stereo spread, dynamic range, and frequency response. Midrange clarity is fine, although it is not as transparent as in the Hanson Mercury recording, which remains an audiophile choice. There is just a bit of edge in the Seattle recording's lower treble, evident in the higher strings from time to time. A good sense of orchestral depth and a touch of ambient bloom complete a reasonably realistic acoustic picture. About my only serious reservation with the disc is its length. At just over forty-eight minutes, it seems a little short on content, particularly when compared to the Hanson-Mercury recording, which includes the Second Symphony along with the First (although you'll have to buy a second disc if you want The Lament for Beowulf). Valery Gergiev, Kirov Orchestra. Newton Classics 8802082. When Sergei Rachmaninov (1873-1943) premiered his Symphony No. 2 in E minor, Op. 27, in 1908, he probably had no idea that his ultraromantic creation would someday compete in the basic classical repertoire with anything his predecessor, Peter Tchaikovsky, had written. He just wanted to write a piece of music that would at least equal the success of his own Second Piano Concerto. Today, you'll find a plethora of Rachmaninov Second Symphony recordings in the catalogue, so given the work's popularity, there is no question why Newton Classics decided to re-release this one in 2011, a recording originally made by Valery Gergiev and the Kirov Orchestra for Philips in 1993. Although Gergiev's rendition may not top the charts, it is a safe and sane approach to the score. The opening Largo is big and lush, with Gergiev adding nothing of his own, which in this case might have been a little too unflattering. Previn (EMI), Pletnev (DG), Ormandy (Sony), Ashkenazy (Decca), and others put more of themselves into the music, making it a tad more affecting. Naturally, there are critics who believe that Rachmaninov's music is already too florid, too ornate, too overly romantic, and needs no further amping up by a conductor, a claim with which I wholly agree. However, there is still some need of an interpretation involved; otherwise, a machine, a metronome, could conduct the music. Not that Gergiev is a machine, but by observing the exposition repeat and adopting a leisurely pace, it makes the first movement one of the longest I've heard. I would have preferred a bigger, more sweeping, more dynamic approach, but maybe that's just me. Certainly, this is a most-lyrical reading, if a little plain. In the rest of the symphony, Gergiev picks up the tempo. The Scherzo has plenty of zip, although it, too, seems a little undernourished in terms of pure intensity. The conductor appears determined to connect everything, even at the expense of losing some energy in the process. When he does speed things up, it seems almost an afterthought and stands in stark contrast with everything that went before, not always making for a smooth continuity. Despite this, the conductor produces more than a few moments of requisite excitement. Next comes the famous Adagio, which in terms of its love interest vies with Tchaikovsky's Romeo and Juliet Fantasy Overture for sheer passionate fervor. Gergiev and his solo clarinet player take it to appropriately poetic heights, the rich Philips sound pouring around our ears like melted butter. When it comes to Rachmaninov's finale to the symphony, it should be both highly Romantic and triumphantly heroic, and Gergiev gives it his best shot. He closes the show in a blaze of triumph that maybe doesn't dismiss one's admiration for the aforementioned conductors but at least gains one's respect. While Gergiev is certainly more low-key than many of his rivals, he maintains his vision for the music throughout the four movements and never lets go. And, admittedly, it is a levelheaded vision. Philips recorded the music at the Marinsky Theater, St. Petersburg, in 1993. Like most of the little jewels that came from Philips, it sounds spacious, slightly warm, and a touch soft, with a modest stage depth and a lovely ambient bloom. 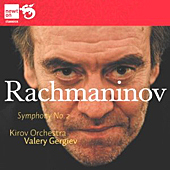 The sound nicely complements the music and Gergiev's interpretation of it, the natural orchestral glow further romanticizing Rachmaninov's rapturous melodies without sacrificing too much detail or definition. 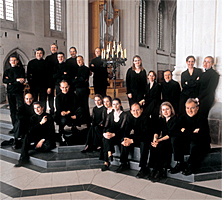 Revered by critics and audiences as Britain's finest chamber choir, Tenebrae, makes a rare visit to the U.S. for a three-city tour November 4-6, 2011. Founded and directed by former King's Singer and choral expert Nigel Short, the twenty-voice choir blends the passion of a large cathedral choir with the precision of a chamber ensemble to create a unique and enchanting sound, one which is as effective in medieval chant as in contemporary works. With an impressive discography of fifteen critically acclaimed recordings, Tenebrae recently completed its first recording project for Decca Classics. The CD is slated for release November 7 in the UK and early 2012 in the U.S. and features the music of composer Paul Mealor, whose moving Ubi Caritas was performed at the recent royal wedding of Prince William and Kate Middleton. The final concert of the tour, at 8 p.m. on November 6 at St. Mary the Virgin (Smokey Mary's) in New York's Times Square, brings the U.S. Premiere of Mealor's Now sleeps the crimson petal. A delicately transcendent setting of Lord Tennyson's poem of the same name, Now sleeps the crimson petal opens from soft unison into a spectrum of warm sonorities exploring the intimacy of the work. Remarkable Theater Brigade Presents Its Third Year of "Opera Shorts"
Unique Evening of 10-Minute Operas by Living Composers - at Carnegie's Weill Recital Hall on November 4. Opera Shorts 2011 features works by William Bolcolm, Jake Heggie, Tom Cipullo, Marie Incontrera, Mike McFerron, Anne Philips, Patrick Soluri, Davide Zannoni, and Christian McLeer, including six world premieres. In its tenth season, New York's Remarkable Theater Brigade hosts its third annual night of Opera Shorts on November 4, 2011 at 8 p.m., at Carnegie's Weill Recital Hall. Earning renown as one of the most delightful presentations of contemporary music around, Opera Shorts produces a full evening of ten-minute operas by living composers, and, in the process, puts a fun face on what is often considered the most serious of art forms. For the first time, Opera Shorts will feature works by the Pulitzer Prize-winning William Bolcom, acclaimed vocal composer Jake Heggie (Dead Man Walking), Davide Zannoni and Mike McFerron, along with pieces by previous Opera Shorts composers Tom Cipullo, Marie Incontrera, Anne Dinsmore Phillips, Patrick Soluri and Remarkable Theater Brigade co-founder/artistic director Christian McLeer. The evening will present ten operas, six of them world premieres. "Opera is usually considered this Very Serious Thing, but Opera Shorts is fun and irreverent and infectious," says Monica Harte, co-founder and general director of the Remarkable Theater Brigade. "It's not suits and gowns; it's much more laidback. I mean, our logo is a pair of boxer shorts, after all!" Among the vast cast of performers for Opera Shorts on November 4 are Metropolitan Opera baritone Chris Trakas, as well as soprano Danya Katok and mezzo-soprano Amanda Crider of New York City Opera. The instrumentation ranges from string quartet to colorful chamber ensembles. North Bethesda, MD, September 27, 2011 – Prominent Polish pianist Piotr Paleczny will perform Beethoven's Piano Concerto No. 5 in E-flat Major ("Emperor") with the National Philharmonic, under the direction of Music Director and Conductor Piotr Gajewski, on Saturday, November 5, 2011 at 8 p.m. and on Sunday, November 6, 2011 at 3 p.m. at the Music Center at Strathmore. The concert will also showcase Beethoven's Prometheus Overture and Symphony No. 6 in F Major ("Pastoral"). At the helm of the orchestra will be the Philharmonic's new concert master, Justine Lamb-Budge, who replaces Jody Gatwood, concert master for the past twenty-five years. Born in 1946, Polish pianist and professor Paleczny graduated from the Frederick Chopin Music Academy in Warsaw and was a prizewinner at five international piano competitions. He is famous for his interpretations of works by Chopin and other composers of the Romantic era. He has appeared as a soloist with such world-class orchestras as Warsaw's National Philharmonic Orchestra, the Polish Radio National Symphony Orchestra, the Chicago Symphony, the Royal Philharmonic and the BBC London Orchestra. Since 1993, Mr. Paleczny has been the Artistic Director of the oldest music festival held in Poland -- the International Chopin Piano Festival in Duszniki Zdrój. He currently heads the piano performance class at the Chopin Academy of Music in Warsaw and serves on the juries of the Chopin International Piano Competition in Paris, Tokyo, Prague, Cleveland and Warsaw. A free pre-concert lecture will be offered at 6:45 pm on Saturday, November 5 and at 1:45 pm on Sunday, November 6 in the Concert Hall at the Music Center at Strathmore. To purchase tickets to the All Beethoven concerts, please visit www.nationalphilharmonic.org or call the Strathmore box office at (301) 581-5100. Tickets are $32-$79; kids 7-17 are FREE through the ALL KIDS, ALL FREE, ALL THE TIME program (sponsored by The Gazette). ALL KIDS tickets must be purchased in person or by phone. The season opens on October 13, 2011, at Carnegie Hall and featured artists include Gil Shaham, Albrecht Mayer, Jean-Yves Thibaudet, Chris Thile, and Viviane Hagner. New York, NY-- After nearly four decades of bringing artistry and innovation to concert audiences in New York and around the world, Orpheus Chamber Orchestra begins its landmark 39th season this October. With two international tours, the first year-long Orpheus Institute residency, the first collaboration between Orpheus and a Composer-in-Residence, the world premiere of four Project 440 commissions by emerging composers, and the return of its famed Carnegie concert series, the Orpheus Chamber Orchestra will carry out one of its most exciting seasons to date. Orpheus's Carnegie Hall season program is a delicate balance of favorites such as Brahms, Haydn, Tchaikovsky, Mozart and Bach with undiscovered repertoire such as Thile, Tippett, Hindemith, Schreker, Honegger, and the works by the Project 440 winners. Orpheus is unique in its drive to explore new works in relation to the old, finding surprising resonances and fruitful contrasts. The 11-12 season also features top soloists Gil Shaham, Albrecht Mayer, Jean-Yves Thibaudet, Chris Thile and Viviane Hagner. A special thread running through the season is Project 440, an initiative to commission four composers in celebration of the orchestra's upcoming fortieth anniversary. The commissioned composers—Alex Mincek, Clint Needham, Andrew Norman and Cynthia Wong—represent different backgrounds and styles, but they all share an uncanny sensitivity to colors and textures. These young composers are redefining the very fabric of the orchestra, and Orpheus, always a fearless ambassador for new music, welcomes the stretch. All except one Carnegie Hall concert date in the 2011-12 season will feature a piece by one of the Project 440 composers. A full schedule of Orpheus' Carnegie season can be found at the end of this release. "I would like to be Maria, but there is La Callas who demands that I carry myself with her dignity." Widely regarded as the greatest opera singer and performer of all time, Maria Callas is the original diva, the ultimate opera icon. Her life story, voice and performances intrigued, thrilled and inspired audiences during her lifetime and continue to do so today. Thirty-four years after her death, Maria Callas is not only the world's bestselling soprano but also EMI Classic's bestselling artist of all time. Diva, artist, style icon. Who was the real Maria? The Callas Effect is a deluxe presentation bringing together two CD's of her finest, most-personal recordings, a new documentary DVD featuring fresh insight from those closest to her, and a lavishly illustrated 124-page hardcover book with an essay illuminating and honouring the essence of Maria Callas, the woman and the myth. Callas dévotées will find new material and food for thought in The Callas Effect. Those less familiar with her personal and musical allure will find an attractive and compelling introduction. Callas is an artist whose music sounds as unique and inspired today as it did in her lifetime and has been named as a musical influence by such diverse popular artists as Celine Dion, Linda Ronstadt, Patti Smith, Emmylou Harris, Jason Mraz and Rufus Wainwright. The CDs contain exquisitely interpreted arias from nearly 30 operas, including such favourites as "O mio babbino caro," "Vissi d'arte," and "Casta diva." The newly-produced DVD documentary-memoir features performance footage, recordings and still photos combined with powerful first-hand accounts of Maria Callas's genius from witnesses of all walks of life. Opera singers, stage directors, actors/actresses, backstage theatre crews, recording staff, impresarios and opera fans who queued for days to buy tickets to her performances all describe how Maria Callas exerted a unique and extraordinary effect on them. Among the interviewees are singers Mirella Freni, Joyce DiDonato and John Dobson, former General Administrator of the Royal Opera House John Tooley, stage director John Copley, EMI Classics Callas biographer Tony Locantro, critic and broadcaster John Amis – and Maria Callas herself, in conversation with Lord Harewood. The glossy, hardcover book contains a new article by Ira Siff, translated into German, French, Spanish and Italian. Siff suggests that Maria Callas, without doubt the most influential opera singer of the 20th century, had such a far-reaching impact on opera that her influence is still gaining momentum today. Her timeless, universal appeal captures the imagination, not only of opera lovers but of people who have never set foot in an opera house. Her career was short but, as Tito Gobbi's daughter, in the DVD documentary, quotes her father as saying, "Maria is immortal." And she is. String Quartets KV 421 and 465; Divertimento KV 138. Quatuor Ebene. Virgin Classics 50999 070922 2. My Random House Unabridged Dictionary defines "dissonance" as "a simultaneous combination of tones conventionally accepted as being in a state of unrest and needing completion; an unresolved, discordant chord or interval." We don't usually associate such dissonance with the music of Austrian composer Wolfgang Amadeus Mozart (1756-91), the widespread use of dissonance not coming into general musical prominence until the twentieth century. Yet here it is: Mozart's String Quartet No. 19 in C major, KV 465, nicknamed "Dissonance." And that's not all; as the ensemble Quatuor Ebene demonstrate with the other two compositions on the disc, Mozart seemed fond of this particular form of development and resolution. The program opens with the String Quartet in D minor, KV 421, from 1783. Quatuor Ebene say that in order to interpret Mozart well, performers must have "absolute technical assurance" and the ability "to let go and bare all." These four young French musicians (Pierre Colombet, violin; Gabriel Le Magadure, violin; Mathieu Herzog, viola; Raphael Merlin, cello) appear to have mastered both areas. The KV 421 quartet displays a purity of line and a clarity of purpose that is hard to deny. 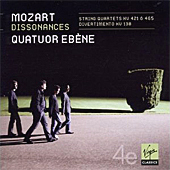 The overall tone is a little darker, more somber, than most of Mozart's work, yet it's always gripping, especially in the hands of Quatuor Ebene. Next, we get the Divertimento in F major, KV 138, a quartet Mozart wrote in 1772 and a distinct contrast to the pieces that bookend it. Generally bright and joyful, with a nostalgic central Andante, the work keeps the dissonance to a minimum, although it is in evidence even in so early a work. Then we find the String Quartet in C major, KV 465, which got its "Dissonance" moniker largely from the solemn introduction of the opening Adagio. Its harmonic ambivalence soon dissolves, however, into a more-radiant spirit. Quatuor Ebene handle the transitions among the four movements smoothly, and they present the music's varying moods with a calm self-confidence and a radiant good cheer. My comparison here was a Teldec recording I had on hand by the Alban Berg Quartet, which seemed marginally more animated to me than that of Quartuor Ebene. Nevertheless, Quartuor Ebene constitute a fine group of performers who exhibit plenty of virtuosity, dash, charm, precision, and poise. Virgin recorded the quartets at Ferme de Villefavard en Limousin, France, in 2011. The instruments appear fairly close up, making for a wide stereo spread, yet with a pleasant ambient glow around the notes. So, it's not as much an ultra-clear, clinical sound as it is a reasonably natural, well-articulated, if somewhat spacious one. Although I would liked to have heard a tad more distance involved, I have no serious complaints on this front since the sonics so well serve to illuminate the music. Also, Bach: Magnificat. 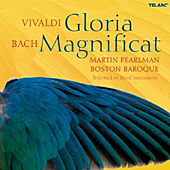 Martin Pearlman, Boston Baroque. Telarc CD-80651. The most striking thing one notices almost immediately about this Telarc release is the clean transparency of the vocals. Voices are notoriously hard to record, particularly massed voices in choral presentations, which often sound either too bright and forward or too recessed and dull. Here the voices don't approach either extreme. The choir seems perfectly natural and remarkably clear, one of the best recordings of its kind I've heard. If I have any reservation about the sonics, it's that the choir as pictured in the booklet insert is standing on an elevated stage some ten feet behind the orchestra, whereas in the recording the singers appear to occupy the same space as their accompaniment. In other words, the recording could have used a tad more depth. Martin Pearlman's Boston Baroque ensemble, about two dozen or so strong, play on period instruments, but they never sound harsh or strident, and their tempos do not plunge headstrong into the realms of the frenetic. Like the chorus they attend, the instruments sound perfectly realistic, and the players perform both works on the disc with grace and decorum. Although the interpretations are not entirely what we think of in terms of period readings, they retain an energy and vigor that one often associates with such performance practices, Vivaldi's Gloria, especially, moving forward with a delicate gusto. For the disc's companion piece, Pearlman chooses to play Bach's revised Magnificat in D-major rather than the earlier one in E-flat. Many other period conductors prefer the original as somehow being more authentic, but it was Bach himself who revised the piece about ten years after its première, supposedly in order to remove some Christmas hymns that tended to limit its value year round and to lower the key to make it more comfortable for several of the instruments. In any case, it, too, comes off as well as any Magnificat I've heard, thanks to the refined liveliness of the performers. An excellent issue. Also, Russian Easter Overture, Dubinushka, and overtures to May Night, The Tsar's Bride, Russian Themes, The Maid of Pskov. 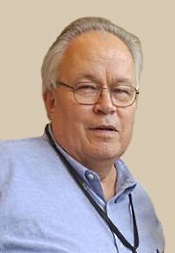 Gerard Schwarz, Seattle Symphony Orchestra. Naxos 8.572788. Quick: Name the first piece of music that comes to mind when you think of Russian composer Nikolai Rimsky-Korsakov (1844-1908). Yeah, me too. Scheherazade. But how about your second thought? Maybe the Capriccio espagnol? Well, since Maestro Gerard Schwarz and his Seattle Symphony already gave us Scheherazade, this present album is a follow-up to it. So, if you have the earlier disc and liked it, you'll no doubt like this one, too. 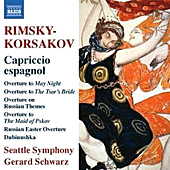 Capriccio espagnol is the Russian composer's tribute to Spain, and isn't it interesting that several of the most-popular pieces of Spanish music came to us via non-Spanish composers like Rimsky-Korsakov, Bizet, and Chabrier? Perhaps it says something about the nature of Spain, its people, and its music that so many composers from other lands have wanted to try their hand at capturing the Spanish spirit. In any case, Rimsky-Korsakov did so with great success, and his five-movement Capriccio espagnol has been a staple of the basic classical repertoire since he wrote it in 1887. Schwarz's realization of the score is quite vigorous and colorful, as it should be. He handles the sinuous slower sections well, too, like the Variazioni, which demonstrate plenty of heart and feeling. As for Spanish flavor, Schwarz lets the composer take care of that. I particularly enjoyed the harp passage in Scena e canto gitano ("Scene and Gypsy song") and, of course, the violin work throughout, which I assume to be that of concertmaster Maria Larionoff. The rest of the program comprises a series of additional short pieces by Rimsky-Korsakov, mostly overtures but also including Dubinushka ("Little oak stick"), a catchy little song he orchestrated in 1905 and reflective of student unrest at the time. Schwarz handles each of the chores with a consummate skill derived from a lifetime of pouring his soul into music. Certainly, one cannot fault his enthusiasm, his continued forward pulse, and the precise execution of the Seattle Symphony. The Tsar's Bride probably displays the greatest degree of Russian flair, with The Maid of Pskov not far behind. The program ends with the Russian Easter Overture, 1886, maybe as famous as the Capriccio. The composer used liturgical themes throughout Russian Easter, which annoyed Tsar Alexander III so much he never wanted to hear it again. More's the pity for him. The piece builds to a wonderfully joyous conclusion in which Schwarz seems to take great relish. The sound, recorded in Benaroya Hall, Seattle, Washington, in 2010 and 2011, appears slightly constricted, perhaps dynamically limited a tad. While it's not extreme, things don't always seem to open up as they should, with a small amount of veiling over the midrange as well and not the very best extension of bass or treble. In order to get the most out of the sound, you have to turn it up somewhat loudly, and then it gets a touch rough. Still, played at a moderate level, the sound is smooth enough and easily listenable. Giuseppe Taddei, Elisabeth Schwarzkopf, Anna Moffo, Fiorenza Cossotto, Eberhard Wachter. Carlo Maria Giulini, Philharmonia Orchestra. EMI 0946 3 5860-2. 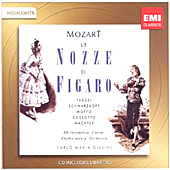 If, for some completely unknown reason, you have never bought Maestro Carlo Maria Giulini's complete performance of Mozart's Marriage of Figaro with Taddei, Schwarzkopf, et al, the folks at EMI give you a chance to sample the performance on a single-disc highlights album. At a reasonably low price, EMI make the CD attractive to curious listeners. The 1959 recording has everything going for it, so it's no wonder it became an instant classic. 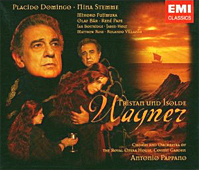 It's got a dream cast and conductor (Giuseppe Taddei, Elisabeth Schwarzkopf, Anna Moffo, Fiorenza Cossotto, Eberhard Wachter, and conductor Carlo Maria Giulini), a great orchestra in its prime (the Philharmonia), the legendary Walter Legge as producer, and the capable Douglas Larter as balance engineer. The highlights comprise fourteen selections that take us from the beginning of the opera (the overture) to the end, with three or four selections from each of the four acts. The disc timing totals about sixty-two minutes in all, from the complete opera's two-and-a-half hours. It is one of the few Figaros I have listened to over and over again on LP and CD, thanks not only to the set's superb singing but to Giulini's elegant, urbane, yet wholly engaging approach to the score. No, it's not the most lighthearted or rollicking interpretation; we wouldn't expect that of Giulini. Instead, it's more of a polished, refined reading, yet still spirited and fun. I find it the most refreshing kind of performance for repeat listening. Taddai seems a touch too basso grave for the role, perhaps, but the ear and mind adjust. Moffo is sprightly and appealing. And Schwarzkopf is simply, well, Schwarzkopf, in her day a reigning queen of the opera stage. If I have any misgivings about this issue, it's that EMI used the same transfer for it that they made in 1989. Although I was hoping for one of the company's newer ART-technology remasterings, it still sounds good for its age. Or for any age. The sonics are a tad thin, perhaps, but dynamic and realistic. There's a good sense of stage depth as well, and a wide stereo spread. Played loudly, there is the faintest hint of background noise, so play it at a reasonable level. As we might expect, we also get an informational booklet with a synopsis of each scene; but the full text and translations of the libretto are also on the disc in the form of a PDF file. You'll need a computer with a CD-ROM drive and Adobe Acrobat 6.0 or higher to access and print it out. For listeners who are not up to listening to the complete opera or for those who just want to test the waters before possibly buying the complete set, this single-disc highlights program seems well worth investigating.